Combat is one of the three major skill groups in Skyrim (Magic and Stealth being the other two). Smithing, the combat crafting skill, is used for making and improving weapons and armor. There are three directly offensive skill trees: One-handed, Two-handed, and Archery. In addition, there are two defensive skill trees: Block and Heavy Armor. The Warrior Stone's effect is to grant 20% more experience in all combat skills with one exception: Archery is affected by the Thief Stone. Combat in Skyrim can have a wider meaning than the skills listed above: everything related to fighting, including the use of important skills from the magic and stealth categories, and virtually limitless combinations of tools and tactics can play a combat role. Along with covering the combat-related skills, this article gives a general overview of combat, and details several alternative combat systems. Combat can take place between the player and/or any number of creatures and NPCs. All participants utilize combinations of physical attacks, weapons, or magic in an attempt to kill or overcome their opponent. Combat normally begins when you or another NPC becomes detected by a hostile creature/NPC or otherwise provokes them into attacking. Drawing too close to a potential enemy, attacking a non hostile NPC and, in some situations, selecting certain dialogue options are all grounds for causing something to attack you. Anything that is hostile to you will appear as a red dot on your compass until combat with that particular hostile has ended. Combat can end in one of four ways: you are killed (which ends the game and requires you to load a previous save), all enemies that are hostile to you are killed, you move far enough away from an enemy that it ceases to attack you, or the combat is forced to end either by a magical effect (i.e. as Calm and Kyne's Peace) or a yield. You may only yield to NPCs whose disposition towards you is high enough or to a hostile guard by putting away your weapons. NPCs whose health is low will often shout "I yield!" and begin to flee, but you cannot accept their yield and the NPC will rejoin combat once they have recovered enough health (some creatures may also flee when at low health). At your choosing, many combat scenarios can be avoided entirely through stealth or magical effects like the ones mentioned above. However, parts of many quests require you to kill specific enemies, in which case combat becomes necessary. Below is a list of the skills contained within the combat category that you and other NPCs can actively use in combat. With the exception of unarmed combat, use of these skills will cause them to increase in level and become more powerful. Unarmed Combat is a sub-form of combat that involves attacking an opponent with your fists, performed by attacking with nothing equipped (spells, weapons or shields) in one or both hands. Unarmed combat does not have its own skill tree and cannot be developed like other skills, but certain races start out with higher unarmed damage, and the ability does have perks and a specific enchantment that may enhance its damage. Unarmed combat may be a reliable type of combat early in the game when opponents are at lower levels, matching your character level. One-handed governs your effectiveness when using one-handed weapons, including daggers, swords, maces, and war axes. With the addition of dual-wielding, one-handed weapons can be put in both hands in any combination. The higher your skill in One-handed, the more damage is done with one-handed weapons. The One-handed skill tree has a total of 10 perks, requiring a total of 21 perk points to fill. Each skill point grants a +0.5% bonus to the damage dealt with one-handed weapons (+2% for NPCs). This bonus stacks with the ones provided by the Armsman perk and by Smithing-related improvements. In-game Description: The art of combat using one-handed weapons such as daggers, swords, maces, and war axes. Those trained in this skill deliver deadlier blows. Dual-Wielding is a fighting style where one-handed weapons are used in both hands and blocking is prevented. While it should theoretically double damage output, it only increases damage per second by 33% because attacks with the weapon in the "off-hand" (typically the left hand) take 50% longer. [verification needed — see talk page] However, two perks that are available later on are exclusive to dual wielding and improve it. The Dual Flurry perk increases damage per second by 35% by improving your attack speed, and the Dual Savagery perk makes power attacks significantly stronger. In addition, the speed of dual attacking is affected by whatever weapon is in your off-hand. For example, if you have a mace in your right hand, but you have a dagger in your left hand, both weapons will have the same attack speed as a dagger. This is nice to gain a longer reach with a bit higher damage compared to two daggers or much faster swinging at a cost of being forced to stay as close as possible to your target compared to two one-handed long weapons. The Two-handed skill governs your effectiveness when using two-handed weapons, including greatswords, battleaxes, and warhammers. Each skill point grants a +0.5% bonus to the damage dealt (+2% for NPCs). The Two-handed skill tree has a total of 9 perks, requiring a total of 19 perk points to fill. In-game Description: The art of combat using two-handed weapons, such as greatswords, battle axes, and warhammers. Those trained in this skill deliver deadlier blows. Archery (also referred to as Marksman) is the skill governing the use of bows and crossbowsDG. Each skill point grants a +0.5% bonus to the damage dealt with bows and crossbows. The Archery tree has a total of 9 perks, requiring 16 perk points to fill. In-game Description: An archer is trained in the use of bows and arrows. The greater the skill, the more deadly the shot. Block allows you to reduce damage from melee and ranged combat, using a shield, a torch, a one-handed weapon, or a two-handed weapon. As perks are gained, Block allows you to do additional damage, disarm your opponent, and gain other benefits as below. The Block skill tree has a total of 9 perks, requiring a total of 13 perk points to fill. In-game Description: The art of blocking an enemy's blows with a shield or weapon. Blocking reduces the damage and staggering from physical attacks. When the player, a creature, or an NPC is hit by certain attacks, there is a chance that the attack's target will be staggered. Staggering interrupts whatever action was being taken by the target and temporarily stuns them, preventing any further attacks until they have recovered. When a creature or NPC is staggered, it also stops them from moving; however, you will still be able to move if you are staggered. [verification needed — see talk page] There are numerous ways to cause staggering, but power attacks are the simplest method and the one most used by NPCs. The Impact, Power Shot, and Power Bash perks will add staggering effects to some normal attacks, and the Force Without Effort ability will improve your overall stagger percentages. Certain dragon shouts are also guaranteed to stagger their targets. With the third word of the Unrelenting Force shout or the Cyclone shoutDB, it is possible to knock a target off its feet and put them into what's commonly referred to as a "ragdoll" state. Like staggering, once the target is ragdolled, whatever action it was taking will be interrupted and the target will be stunned. However, the target is also knocked helplessly to the ground and will have to wait a few seconds after landing before standing up and being able to fight again. If you are ragdolled by Unrelenting Force, the camera will automatically switch to third person and remain there until you have recovered. In these situations, it may appear as though you have been killed, but as long as you can still open the menu and didn't fall too far, you will be able to recover and resume combat. Most NPCs and ground-based creatures can be ragdolled with the exception of Dwarven centurions, spheres, and ballistae, dragons, horses, and mammoths. The amount of Stamina available when you execute a power attack and the amount of Stamina consumed by the attack do not influence how much damage is dealt. However, if you do not have at least one point of Stamina when you attempt to perform a power attack, the Stamina bar will flash green and you will perform a regular attack instead. This means that consuming a food item that restores Stamina over time, even as little as one point per second, will allow you to perform endless power attacks until the Restore Stamina effect wears off. There are no potions, spells, or enchantments that do this - instead, those only provide one-off instant restoration effects or Regenerate Stamina, which does not work for this. All of the foods that provide this effect are listed here. You can perform several kinds of power attacks depending on which movement control you press as you attack and what weapon you are using. If you push the forward input while performing a power attack, you will execute a dash strike, useful for closing the distance to your enemy quickly. Moving backwards will cause you to step back and then strike, useful for avoiding and countering enemy attacks. Left and right inputs can be used to sidestep enemy attacks, and with the Sweep perk, a left or right power attack can strike all enemies in a forward arc when using a two-handed weapon. If you are dual wielding, holding down both the left and right attack buttons at the same time results in a fast, three-hit power attack that strikes with both weapons. If you are using only your fists, you will perform a similar three punch strike when the same input is used. Both of these attack combinations count as three separate power attacks and will consume Stamina accordingly. When using the Dual-Wield Power attack, two slashes are performed by the left hand and one by the right hand. This is probably the reason why the weapon in the left hand determines the velocity for this attack. If you are within about 1-4 blows of killing an opponent, a "finishing move" animation may play, depicting one or more fatal strikes from either a first-person view or third-person "KillCam". If the Savage Strike (One-handed) or Devastating Blow (Two-handed) perks are unlocked, there's a chance that this will be a decapitation. Note that under the right circumstances, NPCs and dragons will also be able to perform finishing moves, both against each other and against you. Details pertaining to "finishing moves" were extensively discussed on this article's talk page. 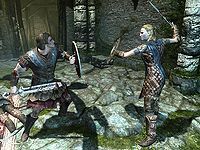 While the information above describes most combat in Skyrim, there are several optional abilities and situations that allow you to fight against enemies in unique ways. A brawl is a fistfight where neither party can be killed. You and your opponent fight without weapons until one of you loses enough health to surrender. Some NPCs will challenge you to a brawl and certain quests require you to brawl an NPC. Rewards for winning a brawl include gold from a bet with your opponent, a reward from a questgiver, obtaining information, or increasing an NPC's disposition toward you. For more information see brawls. Through the events of certain quests, you can gain the ability to transform into either a werewolf or, with the Dawnguard add-on, a Vampire Lord. Both of these forms change combat in a number of ways, including a forced third-person view, faster movement, improved unarmed damage, and unique attacks and abilities. These forms also become stronger in different ways than the normal character and have certain limitations. For more information on these forms, see their respective pages. Version 1.6 of the Official Skyrim Patch introduces the ability for you to use melee weapons and bows while riding a horse. Unarmed attacks, magic, Powers, and Shouts cannot be used. While using melee weapons, you will only be able to use whatever is equipped in your right hand (including two-handed weapons which you will be able to wield with only one hand). When the left or right attack control is used, you will respectively make a low swing on the left or right flank of the horse. If the attack button is held, you will hold your weapon in preparation for an attack and swing when the button is released. This strike will consume Stamina upon release but doesn't seem to do any additional damage. When using a bow, you will draw and fire as normal and will be able to zoom in with the Eagle Eye perk. However, if you ride over especially rough terrain or are hit by a power attack, you will be forced to un-nock your arrow. Also, regardless of where you aim your reticle, your arrow will only fire within the horse's front arc of about 180 degrees. Attempting to shoot farther left or right will simply cause the arrow to shoot out at the arc's limits. Obvious advantages to using the horse-mounted fighting style are that you are harder to attack and are much more mobile. Additionally, if enemies block your attack, you experience no knockback, and can quickly follow up with another strike. One disadvantage to mounted combat is that if your horse is killed while you are riding it, you will be thrown to the ground in a ragdoll-like fashion, and you will be unable to perform any action until you regain your feet. During the Dragonborn main questline, you will gain the ability to tame and ride dragons. This introduces a new mechanic of gameplay that also has a different type of combat. While you cannot directly control a dragon as you would a horse, you can give it basic commands to attack or land and can aid it with certain spells and Shouts. For more details on dragon riding, see this page. The primary aspect of combat is the dealing and receiving of damage between all participants. However, damage can be inflicted in many other ways and the amount of damage dealt can be changed by a number of things. For detailed information about damage see the Damage page. Dual-wielded weapons are governed by your One-handed skill, not your Two-handed skill, since each of the weapons is individually classified as a one-handed weapon. Unlike in Daggerfall, Morrowind, and Oblivion, weapons and armor are not damaged as you use them, and therefore do not need to be repaired. Unlike in Daggerfall, Morrowind, and Oblivion, players are unable to use weapons or otherwise fight while swimming in a body of water. This makes dealing with water-based enemies considerably difficult. If you have access to a cloak spell, activating it before entering water is a good way to damage most enemies without risking retaliation. It is also a handy method of dealing with water-based enemies. Blade and Blunt are not separate skills in Skyrim. Instead, weapon skills are divided into the One-handed and Two-handed skill trees. Within those trees various perks allow you to choose whether to specialize in a specific type of weapon (e.g., swords, hammers, or axes). If you play with a one-handed weapon in only your left hand, finishing moves will not be executed. After a finishing move, the body may get forced under the ground and become inaccessible. This page was last modified on 26 January 2019, at 19:13.